Home > Breweries > Plenty of “pin-terest” in Theakston’s mini Christmas casks! Plenty of “pin-terest” in Theakston’s mini Christmas casks! 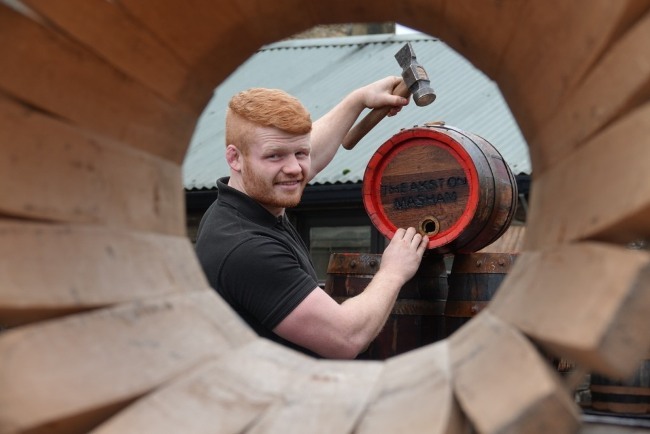 Coopers at a North Yorkshire brewery are creating plenty of “pin-terest” with their mini Christmas casks. T&R Theakston Ltd’s brewery craft cooper, Jonathan Manby, and his apprentice, Euan Findlay, have been spending the last few weeks of the year making traditional wooden “pins”, which will be filled with the world-renowned Theakston’s Old Peculier ale. Each pin holds 4.5 gallons or 36 pints, and are made by hand using the traditional tools of the trade, namely seasoned oak, iron hoops and flames. T&R Theakston Ltd Executive Director Simon Theakston said: “For many real ale lovers our Christmas pins are a festive tradition as important as roast turkey, Christmas pudding and mince pies. “For the last few weeks, Jonathan and Euan have been spending each and every day in the cooperage making our Christmas pins, the traditional way. “In the next week, these pins will be filled with our Old Peculiar, ready for the customers who have ordered them. Further details about Theaskton’s Christmas pins are available by calling T&R Theakston Ltd on 01765 680 000.